Cliff™ PCB spacers give a rigid mounting for PCBs or similar assemblies. Fixing is by self-tapping screw, size number 6 or 8, which are simply screwed into each end of the post. The centre center flat section can be gripped to prevent rotation while fixing. 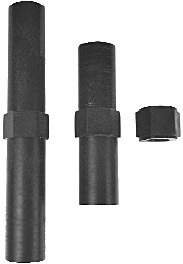 Pop rivets ⅛″Ø are also suitable for fixing to a metal chassis. Packing is 100 or 1000 per poly bag.